The Department of City Planning previewed its East Harlem rezoning proposal at Community Board 11 this week [PDF]. 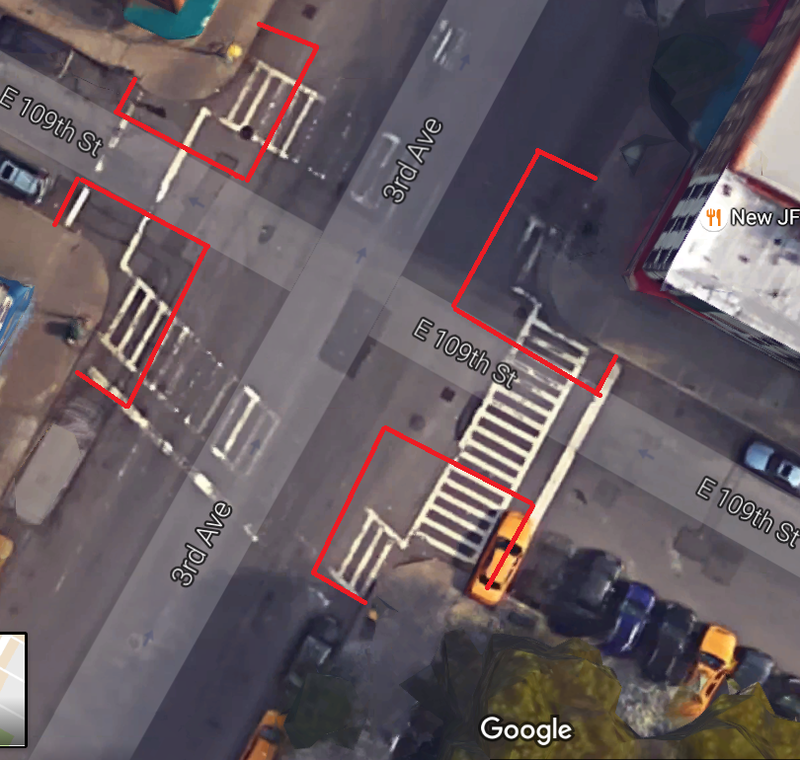 The Department of City Planning is preparing a major rezoning of East Harlem, and it calls for scrapping parking requirements along most of the avenues in the neighborhood. New York City’s minimum parking requirements drive up the cost of housing by requiring developers to build parking spots that otherwise wouldn’t get built. This adds to construction costs and constrains the supply of new housing. On Tuesday, representatives from the Department of City Planning previewed the rezoning at Community Board 11’s monthly meeting. All areas that would get upzoned in the plan will also have parking requirements eliminated. Politico New York reported that parking minimums would be scrapped “along Park Avenue north of 125th Street,” but did not mention whether the same would apply to the rest of the area being rezoned, which is bounded by Second Avenue, Park Avenue, 104th Street, and 125th Street. 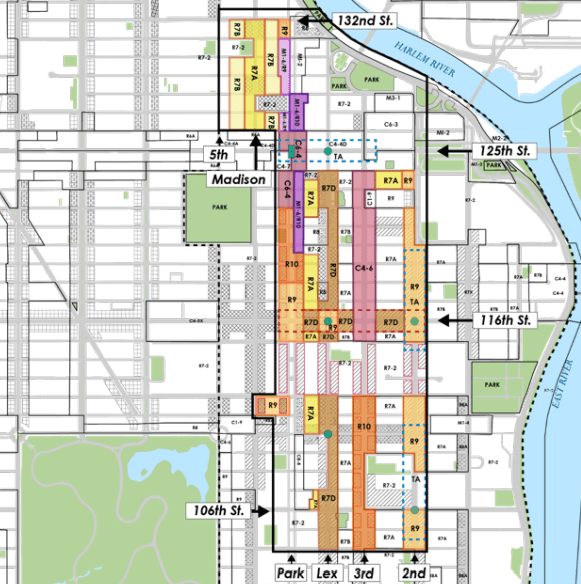 A spokesperson from the Department of City Planning confirmed that parking minimums would also be eliminated along Lexington Avenue, Second Avenue, and Third Avenue, but that Madison Avenue north of 125th Street, which is not being zoned for higher density, would retain parking requirements. “The elimination of parking requirements is a part of our growth-oriented approach to the neighborhood study, so we are applying it in areas we are targeting for new transit-oriented development,” the spokesperson said. Community Board 11, Brewer, and the City Planning Commission will weigh in on the rezoning before it goes to a vote in the City Council. correct – there should be Absolutely Zero Minimum Off street Parking requirements anywhere in the 5 boros. ( including Bayside, SI, Sheepshead Bay ) for any use – residential, commercial, retail, or manufacturing. Changing this counterproductive Zoning Rule would do more to elminate the housing Crisis than any Single Action. But is there also a maximum? Just read through the document and it looks great for the most part, preserving historic areas while steering density to the wide avenues, especially the vacant land on Park Avenue. However, I don’t understand the prohibition on commerce between 112th and 115th (is it a federal holdover?). Those housing project dead zones could use some of that. Amazing breakthrough. Hey, maybe they’ll start making the streets safe for people living there as well. Look at 109th street and 3rd Ave in this street view. I count 5 people standing in the street and 2 illegally parked cars. Normal conditions in NYC. And hey, a pedestrian refuge in the middle of 3rd would hurt either. There is a playground for children here.